Lillie McFerrin Writes: Write on Wednesday: Choose your own adventure! Write On Wednesdays Exercise 17: This week, we are going with Karen's idea for an open choice week. So take a look at the old writing exercises (you can find them listed in my sidebar: WoW Writing Exercises), find one you'd like to try (or retry!) and link it up to the linky below. Short and simple instructions this week. If time is an issue perhaps you would like to try one of the 5 minute stream of consciousness exercises. I remember when I would leave my house giving no thought to anyone but myself, when I filled my pantry with food only I wanted to eat. I remember when all my shoes were safe, my leashes for surfboards, and my leftover plastic bags for banana peels or watermelon rinds. I remember when my couch was free of hair, my floor pristine and shiny, my pockets empty of crumbs. I remember the day I learned to worry about the safety of my shoes, my couch growing a beard, or mystery spots on my floor. It was the same day I found complete, unconditional devotion in a wriggling, black and white package. I remember the day I fell in love. LOVE this! And LOVE your dog!! Absolutely adorable I want to give it a big cuddle! I'm about to start worrying about all those things as I'm looking in to getting a pug puppy! I can't wait to find my unconditionally devoted wriggling hairy package! I liked this post. Short, simple but engaging. Well done. LOOOOVEEEEE. From the start of the second line, I knew exactly where this was going, and I love every word of it. The love of a pet can only be understood by other pet owners. Awwww... so sweet. 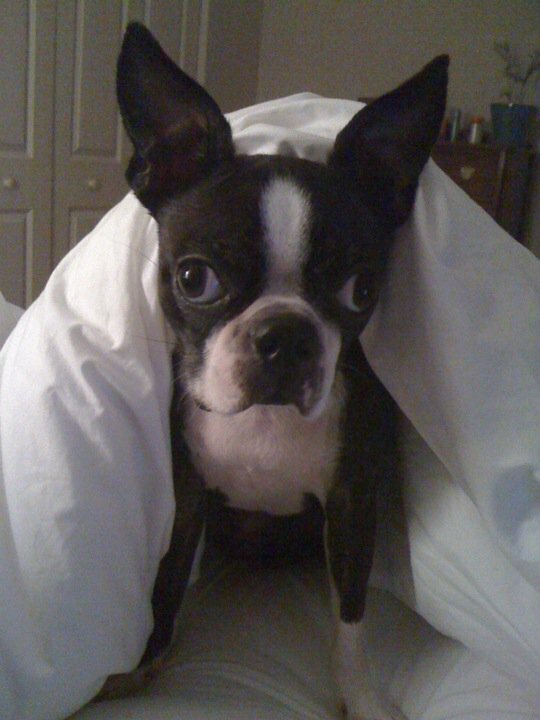 Bostons are amazing. We have two now, and are still so in love with them. :D Looking forward to seeing more of your writing. Yes, this was both funny and sweet. I thought you were talking about a baby until you mentioned the leash. I know how you feel! This exercise has been a popular choice this week. Great work! That photo is a classic! A funny little tale about puppy love! I enjoyed the symmetry between describing all your shoes being safe etc. and then reminiscing about he day you started worrying about their safety. Gorgeous! It's all worth the worrying about shoes and leashes and hair though, isn't it?